How do I set up a new season/committee? How do I change the committee for the new season? How do I add custom content to a match report periodical? How do I have more than one periodical in the same month? How do I add/edit sponsors? Clubs are managed by a committee and each season a new committee is chosen - usually the entire committee does not change - often just a small number of people leave and some new people join the committee. Sometimes the roles of people who stay change. The committee are the organizing body for the club each season so the first step in setting up each season is to create a new committee for that season. A new committee should now be listed in the table of committees. To add these, first click on the newly created committee in the 'Name' column and then you will be taken to the main administration page of the new committee where you will be able to add the competitions for the new season. After configuring your new season you can set your club's 'current' committee. All competitions, teams, game info, periodicals/online magazines etc., pertain to the 'current' committee. The menu items in the top menu bar are automatically redirected to the pages related to your 'current' committee. 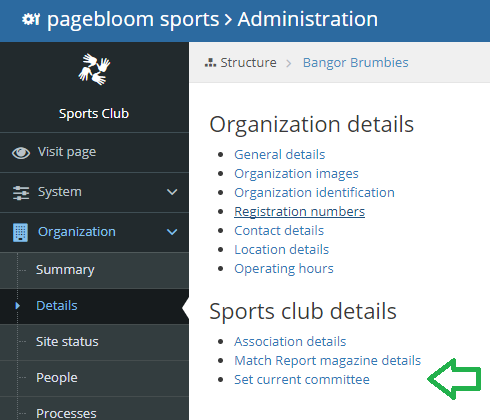 Unlike other systems, pagebloom sports automatically adjusts all of your menu links for the new season when you change the current committee. To see how to set the current committee click here. If you have not yet created a new committee for the new season then do so by following these instructions. Editing periodical editions requires the Article Approver role. The instructions below assume you have this role already. Match report periodical editions are automatically generated to include published match reports in the relevant time period. Custom content is added through the 'From the Editor' article that appears near the top of each edition. Browse to the appropriate periodical. If you don't have a link to your periodical yet, see the Menu Manager FAQ section for details on how to add a link to your periodical. Select the periodical edition in the Other Editions dropdown box and click Go. Find the section titled 'From the Editor', then click the pencil icon to the right and click Edit article. Edit the content of the article, then click Save. The article should be updated. You can format the 'From the Editor' article in any way you like, including creating subheadings and sections. There are no limits on how long this article can be. Because match report editions are automatically created, if the current edition for the month is closed early, a new edition will be created the next time a match report comes through. This lets you have multiple editions in the same month. While logged in with appropriate permissions, visit the page for the periodical edition you want to close early. This edition is now closed. Note: Any match reports that come through in the given date range will still appear in this edition, but match reports after that date will appear in a new edition. In the example above, a match report submitted for a match on 5 Jan will still go into the closed edition, but a match report submitted for a match on 7 Jan will be put into a new edition. Visit the admin page for your website. On the left menu, click Website and then Components. In the dropdown at the top, select either 'Major Sponsors' or 'Minor Sponsors'. If necessary, click the Add component button to create this component. Click Add content item to add a new sponsor. Click Edit on the new entry to rename it, or click Edit media to set an image. Note that for current sports club templates, major sponsor images should be 345x98 pixels in size, and minor sponsor images should be 152x98 pixels in size.